SiteUptime Review - Is This The Best Uptime Monitoring Service? SiteUptime Review – Is This The Best Uptime Monitoring Service? I am Publishing Siteuptime review post after using it more than 8 months for monitoring my websites. 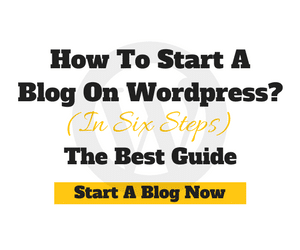 Being a full-time affiliate marketer and my primary source of income arrives from blogs and domains through affiliate programs. But one day I have noticed a sudden drop in sales due to fewer visits to my website. This is due to my website was down, and after pointing out this problem to my (FastComet) web hosting provider, they suggested to use any website monitoring service. 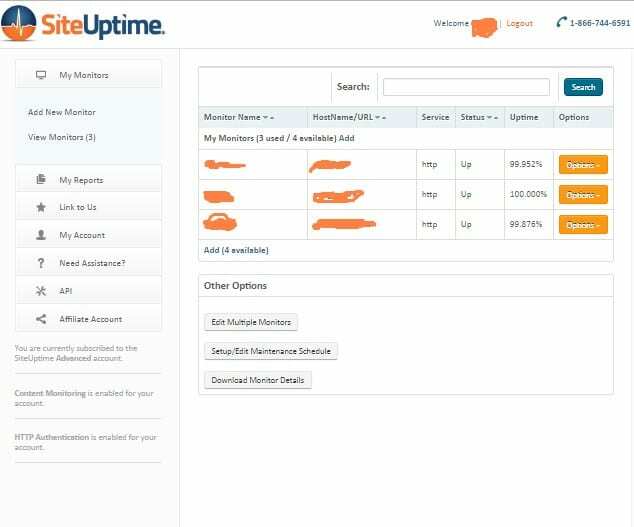 After searching on the internet, I came to know about a service called siteuptime a website and server monitoring tool to use. 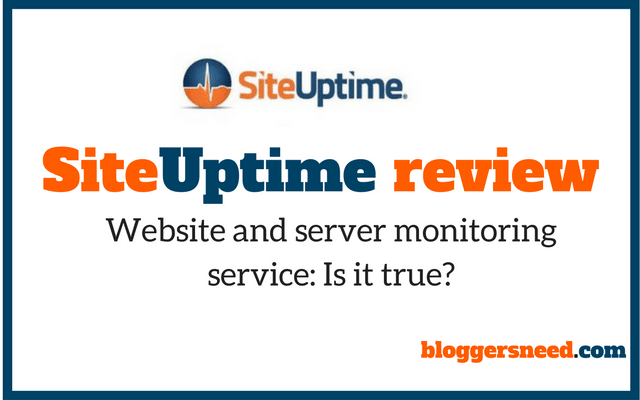 After using it more than eight months to monitor one of my site which prompted me to write this siteuptime review. In this siteuptime review, I am going to test all it’s feature, pros, and cons by providing necessary screenshots. It is everyone’s habit to review the product before buying to know whether it worth to buy or not? Likewise, I searched about siteuptime review in google and read more about it in popular forums, and most of them are downvoted siteuptime and said to avoid it. But I directly visited siteuptime website, and they gave me a free uptime monitoring service to monitor my website to indicate whenever my website failed to load. And this service increased my sales and website traffic by 130% by avoiding downtimes. Siteuptime is a website and server monitoring service to check the availability of websites regularly. With over 125,000+ website owners and custom web app development service providers using their service to monitor their websites. 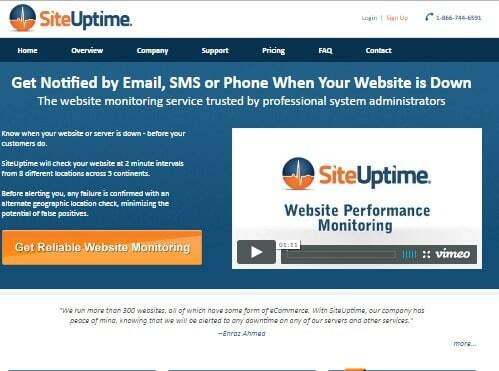 Siteuptime provides best monitoring service for your website, and whenever your website goes down or fail to load, they will notify you via email, SMS or phone. 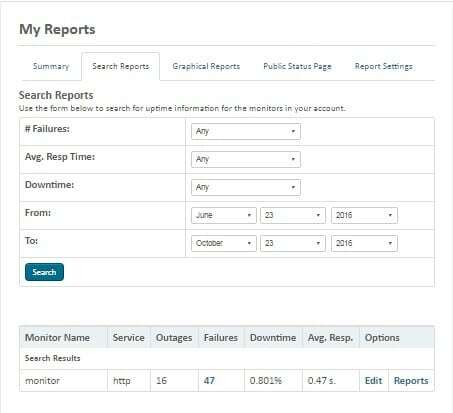 With powerful and easy UI(user interface) it shows the detail statistics of website availability, response times. You can track how often website goes down or up in the user panel. Monitors: Siteuptime works with 7 geographical monitoring locations with multi-check technology. Your website monitored from these geographic locations which are operating independently and with different time checks. Alerts: If your website downs in any of these places its sends the report to a central database and you will get notified via email, text SMS or phone. Siteuptime review about Control panel, it contains options to add websites, view monitors, my reports option, API, etc. Under my reports tab, I am clicking search reports to find how many times my website had downtimes. Furthermore, I have set date from June 23 to October 23/2016, and after clicking search, It showed me that my website had 47 failures and 0.801% Downtimes. 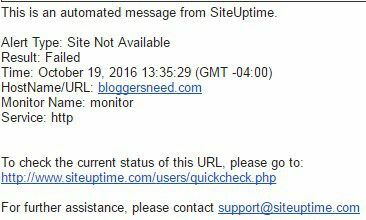 When my website was down on October 19, 2016, siteuptime alerted through e-mail. Then I took this issue with my hosting provider and confirmed it was due to a technical problem. 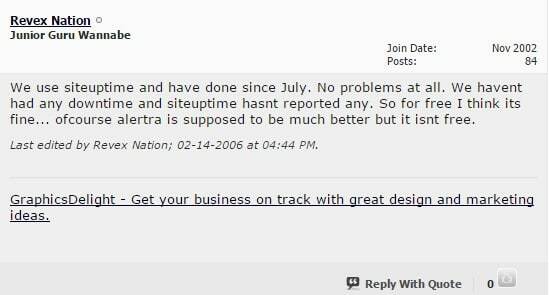 First good review about siteuptime is the inexpensive price. Lots of positive about their reliable service. It has 2 minutes intervals check and doesn’t have minute by minute check. You can monitor only 6 websites per account. Paid service reports are more accurate than free service. Free service sometimes provides false uptime and downtime reports. Free plan allows only 1 website to monitor for every 30 minutes time intervals. Standard plan will monitor 3 websites for every 2-minute intervals and also includes multiple alert contacts, 10 Free Sms/Call Credits. 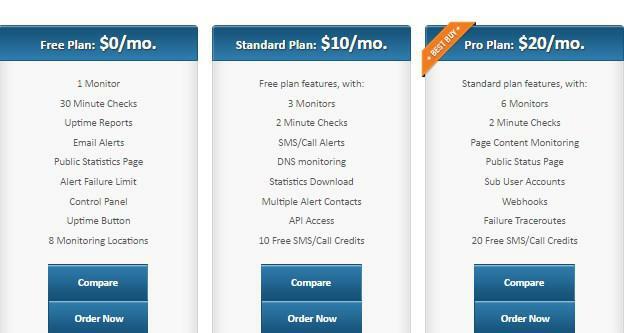 Premium Plan can monitor up to 6 websites at a time with 2 minutes check by page content monitoring also plan includes some best features such as Public Status page, webhooks, Failure traceroutes with 10 Free Sms/Call Credits. The screenshot of user testimonials are taken from forums and communities and users love to use siteuptime website and server monitoring service. Why should you use siteuptime? We are choosing a web hosting providers to host our websites, and many of the web hosts promise a 99.99% uptime guarantee, but we know that this is not happening every time. Finally, there are many cases our website fails to load for hours or even days. Your Bussiness depends on your website, and by this downtimes, you may lose thousand of dollars and visitors or traffic then what is the need to continue your online business when you are losing worthful visitors? 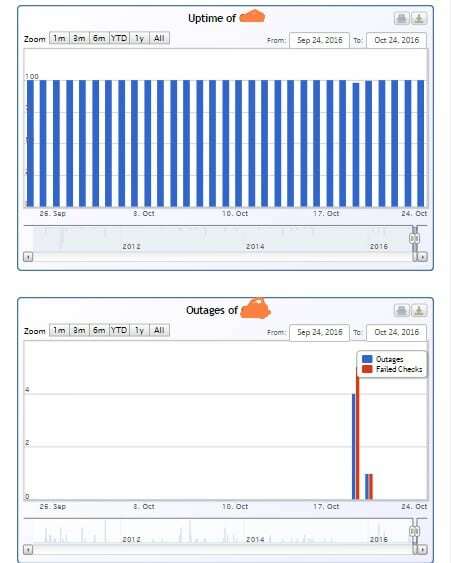 So it is necessary to use uptime monitoring service to save your dollars and visitors. Siteuptime undoubtedly the best uptime monitoring service to monitor the website and got good reputation from users and it keeps my website stable and online all the time. And alerts whenever my site goes down and helps to fix the issue as fast as possible. I suggest you, to use premium service because it gives 100% accurate result. Another good thing siteuptime provide free service to use so guys give it a try and decide whether to use or not. Thank you for writing this. 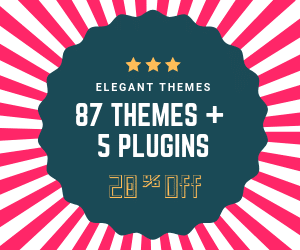 I have been getting emails from them that my site was failing well over a hundred times and then it had said it was failing double as much which I thought to be odd. Since I am not signed up with them, it’s probably fair to say that some of these warning are false. Thanks for clearing the air. Have a great day mate.